There is a vast array of hanger styles to choose from including wire, wood and metal. Since there is such a large variety available to buy it can become difficult selecting a hanger to suit your individual needs. However, this decision becomes much easier once you consider the benefits of plastic hangers. 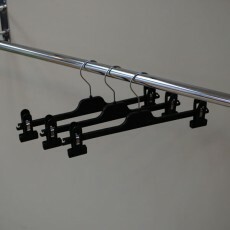 This type of hanger can hold any item from dresses to heavyweight garments such as coats without cracking, bowing under weight or distorting out of shape. Another notable benefit of a plastic hanger is that they are completely rust proof. Therefore, you won't have to worry about the hanger discolouring your items of clothing even if they become exposed to water. 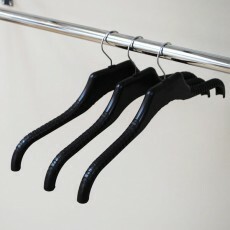 As well as being rust proof, the plastic hanger is also known for leaving your items crease free. At Shopfittings we believe that every retail environment should be able to express their design visions without limitations. 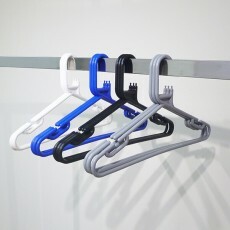 We stock a large selection of plastic hangers for you to achieve just that. 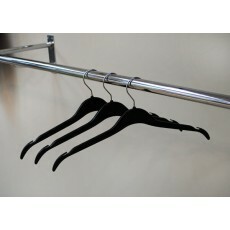 Our stock includes coat hangers, clear lingerie hangers, trouser hangers, suit and jacket hangers. Click here to view our entire range of clothes and coat hangers that will be at home within any space.